This launch is currently online via Space.NK should you be interested! "Hourglass Cosmetics has announced the launch of 1.5mm Mechanical Gel Eye Liner. The waterproof gel liner is encapsulated in a 1.5mm mechanical pencil, offering precision accuracy and ease of application. The product offers a supple, moisturising formula that creates dramatic definition while resisting transfer, promoting extended wear. The eye liner is available in a package of three, each lasting approximately 17 to 20 uses." You can find them here - link. A new and utterly beautiful Models Own collection is on the way! "NEW from Models Own – DIAMOND LUXE – containing real Diamond Dust! 10 brand-new opulent polishes that are Luxe by name and Luxe by nature. Each polish contains real Diamond Dust to deliver a completely unique, multi-dimensional super-sparkly finish and some serious bling appeal! The ultra-fine diamond dust glides smoothly onto nails, giving a hint of sophisticated shimmer, coupled with the colourful shades for year-round grown-up glam. Quick-drying, achieve a long-lasting, ultra-smooth sprinkling of sparkle for the most glamorous manicure." They will cost £4.99 each, launching EXCLUSIVELY online at www.modelsownit.com on September 19th in all UK Models Own Bottleshops from September 20th and in Superdrug stores nationwide from September 24th. Calling all fellow candle addicts! "The new Ted Baker Residence home fragrance collection will be launching in John Lewis this October. The Residence candles are priced £28 and reed diffusers £35, available in the following fragrances: LONDON: Wild rose & leather, MIAMI: Star Apple & Passion Fruit, NEW YORK: Cedarwood & Vanilla, ATHENS: Fig & Olive Blossom, SYDNEY: Ocean Air & Sea Salt and TOKYO: Green Tea & Bamboo. "I can hand on heart say I have never wanted a candle collection so badly, from the beautiful white and flamingo adorned packaging to the mention of a good few of my favourite cities. Forget want, I need them! I don't think I am wrong in saying that this will be on so many Christmas wish lists "Haircare brand ghd has announced the launch of ghd curve, a new collection of curling tools to sit alongside its existing stylers and hair-dryers. Featuring two wands and two tongs, the range offers a variety of styling options for all hair lengths and textures. Challenging the issue of curl drop, ghd has used their patented tri-zone™ technology in ghd curve to create curls that last up to 24 hours. Six sensors in the tri-zone™ barrel heat to 185°C and the temperature is maintained constantly and evenly which is kinder to hair while delivering long-lasting results. Hair tools comprise: ghd curve soft curl tong, a 32mm large barrel that creates volume and soft waves on longer hair; ghd curve classic curl tong, a 26mm medium barrel to create consistent curls for classic style and volume, even on shorter hair; ghd curve creative curl wand, a tapered wand to create tousled and beachy texture on all hair lengths; and ghd curve classic wave wand, an oval shaped wand to create deep waves on longer hair." Rodial Christmas sets will be launching this coming October! "Skincare brand Rodial has announced the launch of 10 Christmas gift sets for the festive season. The collection ranges from whole product sets, including the latest Dragon’s Blood range, to small tree gifts including the Stemcell Glam Balm Lip. Each gift set is tailored to a specific skin type and contains key ingredients for anti-ageing and maximum hydration. The gift sets include: Bee Venom 24 Carat Gold Kit, Bee Venom Kit, Glamoxy Snake Kit, Glamstick Kit, Stemcell Superfood Hand and Lip Kit, Stemcell Superfood Kit and SuperAcids Kit. Harrods will be exclusively stocking the Bee Gold Set." Those visiting Fashion Week are in for a treat! "Fragrance brand Penhaligon's is continuing its role as the Official Scent of London Fashion Week this month, this time with its Samarkand fragrance. The British fragrance brand has been the official supplier of London Fashion Week and London Collections since 2013, using Quercus, Lily of the Valley, Blenheim Bouquet and Bayolea to scent the high profile events. Samarkand is an oriental fragrance comprising notes of sweet flowers, spices and woods; inspired by the ancient city of Samarkand. Samarkand is available as a Classic Candle in all Penhaligon’s boutiques, concessions and online at penhaligons.com". The ghd curve sounds so exciting! I don't even own a pair of ghd's as I don't like straightening my hair. But considering how popular they are, I imagine the curling wands will be a hit! 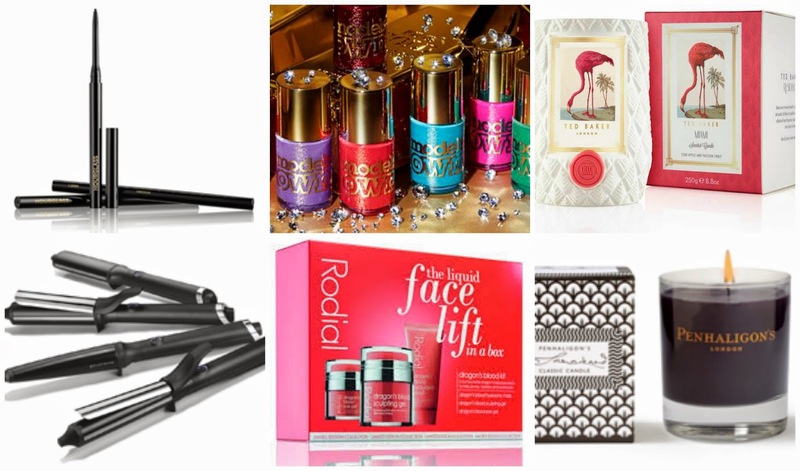 Yep, that GHD curl wand is 100% on my Christmas wishlist! The new Models Own polishes sound amazing!